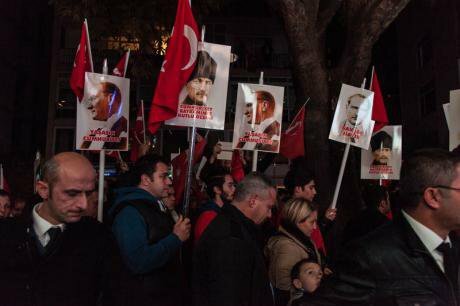 A rally in istanbul to mark 92nd Turkish Republic Day Anniversary. Demotix/Avni Kantan. All rights reserved. (Antonio Gramsci, Selections from the Prison Notebooks). 2015 will probably be remembered in Turkey as a year of inconclusive elections, parliamentary deadlock, economic stagnation and intense political violence. Ideological polarization has been particularly worrying, as one distinguished political scientist – Umut Ozkirimli – recently argued that the Turkish nation-state is no longer salvageable. This is because the citizens have been divided into hostile groups, each with their distinct sphere of influence, e.g. Kurds in the east and south-east, secularists across the Mediterranean coast and conservative-nationalists in the inland provinces of Anatolia. One may even notice many similarities between Turkey today and the pre-civil war Lebanon of the early 1970s. This tense situation has emerged mainly because negotiations between the AKP (Justice and Development Party) and representatives of the Kurdish political movement, the HDP (Peoples’ Democracy Party) and the PKK (Kurdistan Workers’ Party), recently collapsed. The optimism of the so-called ‘Peace Process’ period (March 2013 - June 2015) has now been replaced with an increasingly violent struggle between the PKK and Turkish security forces, the skirmishes spiraling into urban areas and claiming the lives of many civilians. Even after the collapse of negotiations, the HDP has consistently utilized a political language derived from the concept of ‘critical human security’ – namely the idea that the security of all peoples of Turkey can only be ensured if their existence as communities in their own rights would be recognized in the constitution. The first step to realize human security today would be to immediately stop the armed conflict with the PKK and to re-start negotiations. Yet, the HDP’s human-oriented radical democracy stands in stark contrast to the current national security discourse of the AKP and mainstream media. Since the 7th June elections, the AKP leadership and pro-AKP columnists have argued that the Kurdish rights issue in Turkey can be resolved through military action against the PKK even though this idea goes against the rationale of the AKP’s own erstwhile Peace Process initiative. The HDP was very successful in the June 7 elections, comfortably passing the 10 percent national election threshold and gaining more than 13 percent of all votes. However, the Peace Process and the party has come under sustained attack ever since. Government spokespeople have repeatedly accused the HDP of sponsoring terrorism, some even demanding the party to be banned by the Constitutional Court and it members to be arrested. Many HDP buildings have been burned down by ultra-nationalist mobs while party supporters have been murdered by suicide bombings – allegedly organized by the ISIS – in Diyarbakır (Amed), Suruç (Pirsûs) and recently in Ankara. The HDP was the primary yet not the sole target of the Ankara bombing on 10th October 2015 as liberals, members of the secularist CHP (Republican People's Party), various labor unions, and socialist youth organizations had also taken part in the rally and demanded the Peace Process to continue as seen in one of their placards: 'how much we have missed to look at a bloodless sky'. In the aftermath of the Ankara bombing, the HDP leadership has decided to stop organizing election rallies due to concerns over the persistence of physical harassment and death threats as well as lack of substantial help from state authorities. The inability of state security forces to ensure the safety of the HDP members means that the November 1 election competition cannot truly be 'free and fair'. The escalating violence increasingly threatens to slip Turkey into a chaotic civil war such as the ones currently being witnessed in the neighboring Syria and Iraq. Many citizens of the country – in particular the HDP sympathizers within the Kurdish political movement and the Turkish left – no longer blame an enigmatic ‘deep state’ for the current state of affairs, but those who are in charge of the government. The AKP’s recent shift towards Turkish ultra-nationalism contradicts with the liberal democrat attitude the party followed during the 2000s. Once, the AKP was the pioneer of democratization reforms aiming to peacefully integrate communities (e.g. Kurds, Alevis and non-Muslims) that had been either marginalized or badly neglected by the old Kemalist state. The AKP’s democratic credentials have been increasingly questioned in recent years as serious criticisms have been launched on key issues – e.g. the freedom of the press, the heavy-handed treatment of protesters as seen during the Gezi and the conduct of the war with the PKK. The list of problems may be expanded, but it should suffice to say that Turkey's international image has been severely tarnished in the last few years. In the domestic realm, the AKP's majoritarianism based on a monolithic Turkish Sunni-conservative identity promotion have been challenged by rising social movements, the spirit of resistance and protest becoming popular among its opponents. This situation has created an organic crisis for the AKP's hegemony over the sociopolitical realm. By the end of the 2000s, the AKP had successfully eliminated the hold of Kemalists over the political system. From 2011 onwards, it has begun to build a new regime the party leaders fondly refer to as ‘new Turkey’. In terms of the quality of democracy, there is nothing new in this Turkey. The archaic Kemalist vision of aggressive secularism and Turkish nationalism – which prosecuted Kurds, conservative Muslims and non-Muslims for decades – has merely been replaced with another state-imposed value system. This time, the official ideology is based on ‘Turkish-Islamic synthesis’ and neoliberal economics. It is no surprise that all who dare to reject the new social contract such as Kurds, Alevis, seculars, liberals, LGBT people and Marxists are consistently accused by the government of treason, terrorism or conspiracy. In between the run-up to the June 7 election and the upcoming November 1 snap elections, Turkey’s agenda has gotten stuck on electoral campaigns. However, the urgent conditions of the day call for a genuine democratization momentum beyond daily calculations of electoral politics. The November 1 election is widely expected to produce a hung parliament. Regardless of the outcome, it should be clear that the salvation of a Turkey struggling with intense ideological polarization, political violence and declining democracy may only be possible if a broad coalition of social forces unite to create a much more democratic and pluralist political system. Since the foundation of the republic in 1923, Turkey has not been able to build an inclusive regime that respects the heterogeneous nature of its society and individual liberties of citizens. If the country is to survive in its current borders, a constitution based on consensus may be the first step towards building such a system. Despite facing major barriers such as the 10 percent electoral threshold and bombing attacks, the HDP and its allied social movements have so far consolidated their position in the sociopolitical life of Turkey. Any administration that would overlook their radical democracy-oriented political demands and their challenges to the status quo may govern Turkey but it will not manage to rule by consent.